Discussion in 'NDS - Flashcarts and Accessories' started by StruttingPhil, May 10, 2013. My slot 1 cart is a DSTwo with a 32gb SD Card. Currently I cannot boot any ROM lager than 16 megabytes through PSRAM Mode with my 3in1, and if I try to copy a game like Pokemon Mystery Dungeon Red Rescue Team, it will Erase ≓41% of the NOR, and then freeze. Tha rom is unpatched, I dumped it myself. 1. You don't even bother to state what loader your using. 2. You didn't identify your the version of the 3in1 you have either. As this effects what version you should be using. A self-dumped copy of the game will work. I already also tested the released list version of the game and it loads and runs just fine. which version of the loader are you using. Your problem is the incomplete support for NOR, a built in bug, of the 0.58b version working with a 3in1+. The MX version is for people using M3 slot1 only. Version extension of ExpLoader is more important than think. Then you got something wrong with your setup to begin with. Likely cause is you do not have the INI file in the root directory. Just checked, tha hardware is a version three . 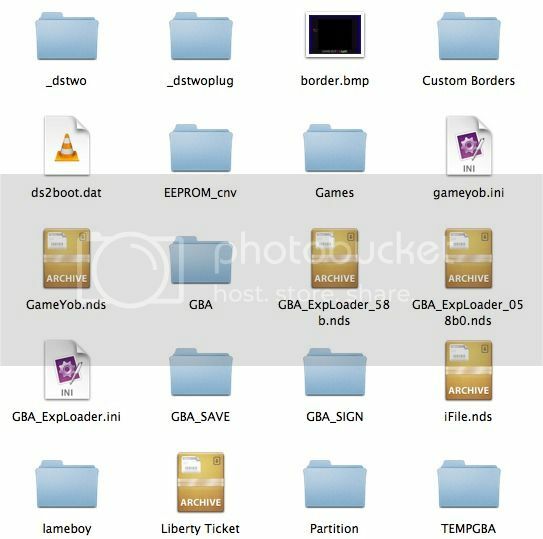 The ini is in there, only one of the two nds files in in there, ill fix this. 3in1+ has 64MB of NOR, while every other version has 32MB of NOR. Tested from 058b0 - same issue - these are my current contents. Do the ROM's [==] need to be in a specific location? Are you running it from moonshell or the game menu. Well lets see what is left on the cause. 1. you got a defective 3in1+. 2. The rom is oversized when you dumped it. In this case you just need to trim it to fix it. 3. Latest version of the GUI breaks ExpLoader. 4. The contact pins barely touch the slot2 PCB. Without actually examining what you got physically, any guess at this point is as good as any other. What is the size of your ROM? What is used to trim the ROM, and will a trimmed ROM's Save file work if it is restored onto a real game cart? Besides this, Ill check out what I can do with the physical cart without opening it up, there is a chance I will return this since I recently got it from Real Hot Stuff. My SD card is acting strange, this could also be the cause of it, Ill format it, clean it and verify it later. Mine also returns the same memory 33,554,432 bytes. Is there any way to verify the memory on the 3in1? this is some scary spooky stuff. I have heard of those getting 3in1+ that were used previously before. Having one being defective is likely more common now since they are not sold anymore and you can only get the version 4 of the 3in1. You should just pick up a another 3in1 to use if it is the case.